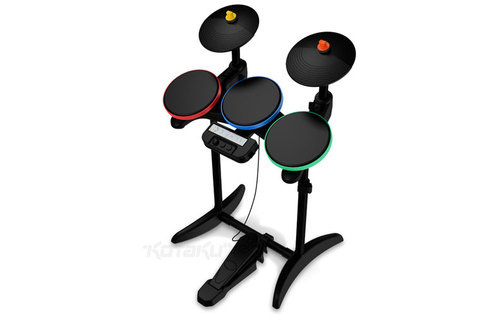 Following up on yesterday's revelation of the guitar controller for Guitar Hero 5 comes a bit of news about the new drums, pictured above. As with the guitar, it appears there are only minor revisions. The cymbals are round and more drumlike this time, and the foot pedal now attaches to the bar at the base of the stand, which has been moved to the floor. For some odd reason, the controls (face buttons, D-pad, etc.) have been moved in front of the middle drum, perfect for your friends to hit it accidentally. I'm just glad they didn't add on another pad, aren't you? 22 new songs have been revealed, as well. Just yesterday I was talking to Nick about the previous reveals, and how few songs I actually knew off the top of my head. My trepidation is somewhat relieved by the inclusion of Nirvana, Bon Jovi, and, for all your headbanging angry German needs, Rammstein. Anyone else have a favorite song on the new list? Page created in 0.2384 seconds.